Hooray! Simon's STAMPtember realease it's finally here! On today's Blog I am featuring the exclusive Picture Book Cupcake die. I am so excited that you're joining along with me to Celebrate this EPIC Party YAY! a full Month of stamping celebration and exclusive releases. In celebration, I am thrilled to share with You 3 Clean and Simple Designs that I had created for this exclusive release. So, that being said. Let's Get Started! First, I started by die cutting the Star of the show "The Picture Cupcake" out of white cardstock using a die cutting machine. As, you can see in the picture above. There are so many ways that you can use this sweet little Cupcake die. But, today here are my 3 examples down below. For my first example, I Designed a Thank You Card by coloring the bottom piece of the Picture Book Cupcake with Copic Markers Y21, Y32 And, heat embossing the top part with Judikins Iridescent Sparkle embossing powder. For the layering, I adhered 5 pieces together for the bottom part and 5 for the top creating dimension. This step is optional (as you can easily leave it flat or create dimension with fun foam or foam mounting tape.) For the sentiment, I stamped with Black Ink one of the sentiment in a piece of white cardstock from the Uplifting Sentiments stamp set. Then, I adhered the backed of the Sweet little Cupcake along with the sentiment to a white embossed panel. For embellishments I adhered a few Moonshine Assorted Sequins And, to finish it up I adhered the card panel to a standard A2 size Neenah Desert Storm 100lb card base. For my second example. I designed another Thank You card with 3 cupcakes in the card panel. I started by die cutting with a die cutting machine 3 bottom parts of the Picture Book Cupcake out of Dark Chocolate cardstock and 3 of the top part out of Ivory cardstock. Also, I white heat embossed one of the sentiments from the Messages for Every Day stamp set with White Fine Detail embossing Powder in a piece of Dark Chocolate cardstock. For the layering, I adhered the backed of the Cupcakes along with sentiment with foam mounting tape to a white panel that I had previously created with the Diagonal Stripe stencil and Transparent Texture Paste Then, I covered up the whole topping part with Glossy Accent for a shiny dimension. And, to finish it up I adhered the backed of the card panel to a standard A2 size Dark Chocolate card base. For my third and last example, I designed a Cupcake Birthday Card by die cutting the bottom part of the Picture Book Cupcake out of Crimson Glitter cardstock and the top part out of white cardstock. For this card I used the Diamond Waffer background die along with a die cutting machine to die cut out of a Neenah Classic Crest 80lb Solar White the card panel. For the card panel layering I did the inlay die cutting technique. I started by die cutting the Picture Book Cupcake in the center of the card panel background. Then, I adhered the backed of the background panel with liquid glue to a Schoolhouse Red card base. Also, I adhered with foam mounting tape the sentiment that I had already stamped in a piece of white cardstock from the Messages for Every Day stamp set. To finish it up, I adhered the topping and the bottom part of the Picture Book Cupcake to the center of the card along with a few gold sequins from my stash. Because, we are having a big celebration Simon Says Stamp was so Kind and had provided a special gift for us. Please feel free to used the code down below to get the DoodleBug Latte Love Shape Sprinkles stickers FREE with any purchase. But, wait! there are many, many more gift options available throughout the party!!! Yay! We had made it to the End. I hope you get Inspired and give these design a try! Thank You, your time is valuable. Don't forget to spread kindness, Today and Always. All products were personally purchased by me. Except for the Picture Book Cupcake die. 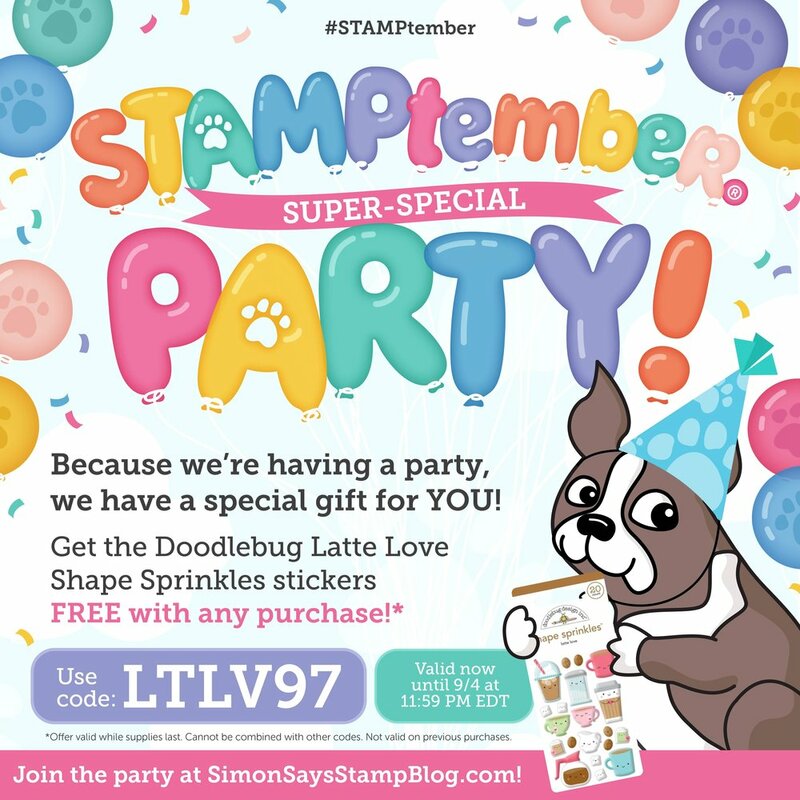 I am creating this blog as my participation with Simon Says Stamp STAMPtember Party Celebration. Also, with the purpose of sharing how I design my cards. The information provided here is based in my own opinion and creativity. I am not an expert and I only share the way that I design my cards. I am sharing the products mention here. Because, I Use and truly Love them.